This letter was written by Edgar B. Bennett (1842-1918), the son of Smith Bennett (1807-1875) and Susan Snow (1809-1851) of Monroe, Connecticut. 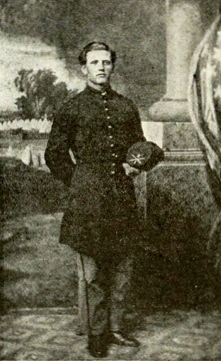 He served in Battery K, 1st Connecticut Heavy Artillery. He remained with his battery until March 25, 1865 when he was slightly wounded and taken prisoner during the Battle of Fort Stedman ¹ (in front of Petersburg) and confined in Libby Prison for five days until he was paroled. On April 9, 1865, while on parole, he married Mary E. Marsh (1849-1919), daughter of Lewis and Evaline (Stone) Marsh. One month ago yesterday we parted but little thought then either of us that we would be separated this length of time but my dear, I hope it will not be another month before we can be together again. The remainder of the boys got back Sunday night — 9 of them. They left home on the 27th of April so as to get their discharges but was used worse than we were that stayed our full time at home. I am glad to hear you were well and hope you will continue so for I should not like to hear you was sick but I was afraid when you told me how fast you had grown poor. I was afraid you were going to be sick. Yes, my dear, I will know how to sympathize with you in sorrow when I get home and in joy for we have been parted and know what it is and in place of our thinking less of each other, our affections are fixed stronger upon our hearts and will continue so if we both are true to each other. And I know we both are. 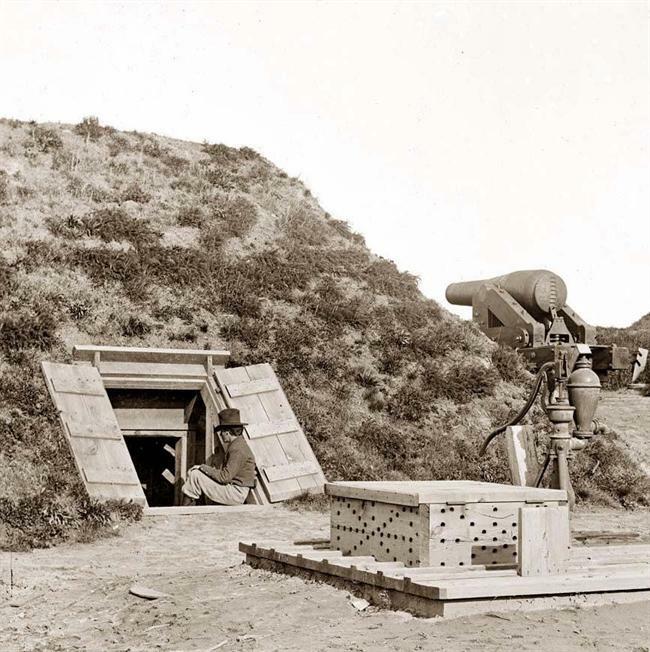 Fort Darling in 1865. One of the Columbiads is seen at right. I mentioned in my letter on Sunday that I would be on patrol Monday. I was not on the one I thought I would be and I was glad of it. I was on police around camp while H Company with 16 horses went after what we call the “little fellow” — that is one of the Reb’s large guns. It weighs 21,745 pounds and they got stuck with it and could not get it along so they are after it again today. But it is no so warm today. We have plenty of good ice water here now. The officers send off after ice to the farmers here and get it and so we have all we want but it is not out of reach. I went cherrying and got all I could eat and then we went and got a lot of mulberries. Wortleberries are ripe. There was some in camp today for sale — only 25 cts a quart. There is everything here mostly to buy.